You've grown tired of preparing meals on the sliding seas so you return to the town of your childhood to re-open an old bake shop filled with delicious memories. Only, when you arrive, you discover memories aren't your only company and you aren't the only baker in the kitchen! Who knew a ghost could throw flour and bash eggs so well! 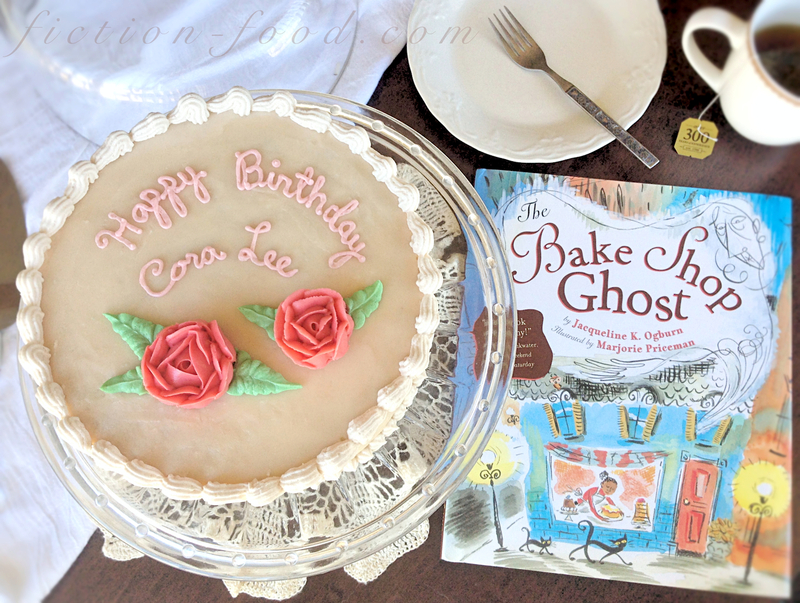 The Bake Shop Ghost (pub. 2005) is a decadent picture book written by Jacqueline K. Ogburn and illustrated by Marjorie Priceman. In a swirl of color and prose we are given the story of two women, one living, one dead, vying for the ownership of one kitchen, both ultimately learning to embrace change, friendship, and the unexpected. Compassion and compromise, with a lot of determination on both ends, are also strong themes in the story. And there's cake. Oh, so much cake. "Make me a cake so rich and so sweet, it will fill me up and bring tears to my eyes. A cake like one I might have baked, but that no one ever made for me." 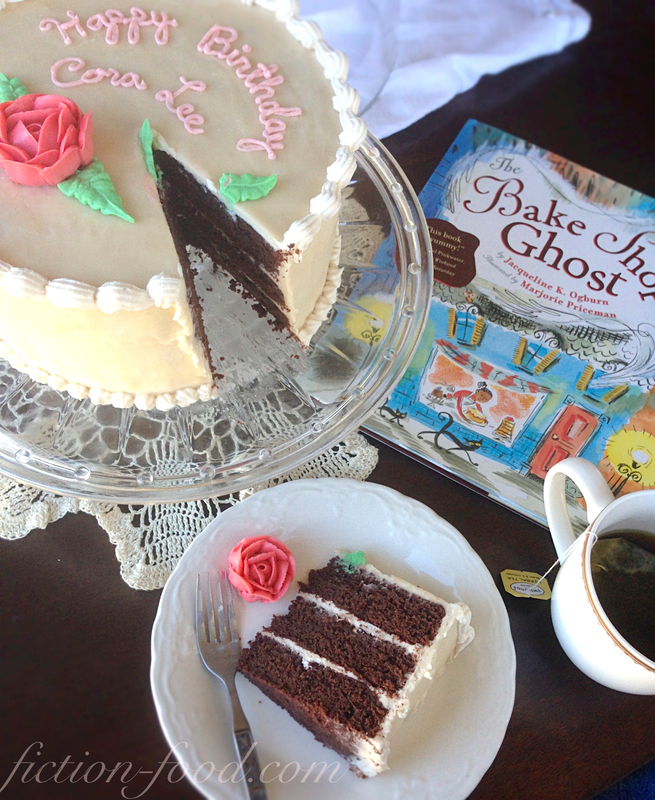 Click here for a reading of The Bake Shop Ghost on NPR by Daniel Pinkwater & Scott Simon. In 2009 Lorette Bayle directed a wonderful 17 minute film based on the book starring Kathryn Joosten and Marianne Jean-Baptiste. 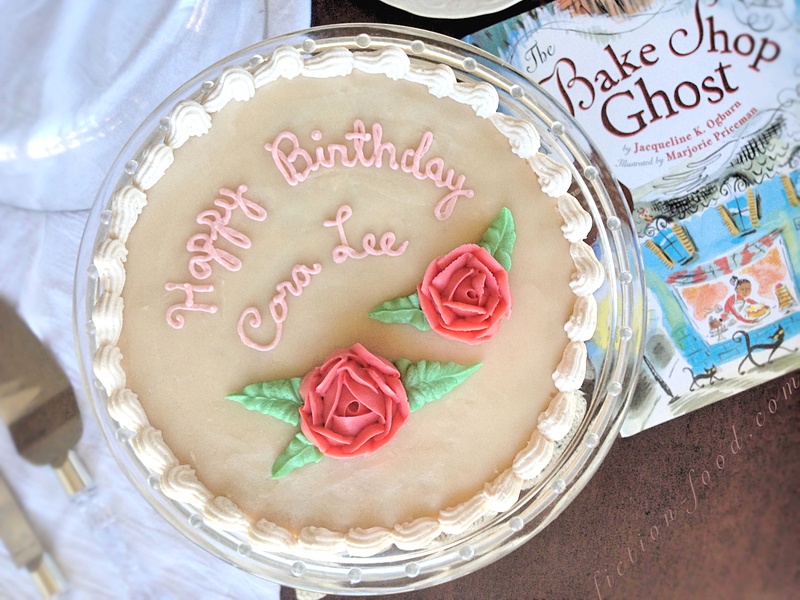 The film kept the title "The Bake Shop Ghost" at the insistence of Ms. Ogburn, who was shown the script and present for about half of the filming (I love it when the authors are included!). Ms. Ogburn said that Lorette "was a very generous film-maker". The movie was in the short film circuit for a long while and will be available to purchase online in the future (Ms. Bayle kindly sent me a copy of the film and said she'd let me know when it becomes available to the public). The film is a wonderful adaptation and expansion of the picture book. Much of the dialogue is directly from the book and even the cake at the end of the film is from the book's recipe! 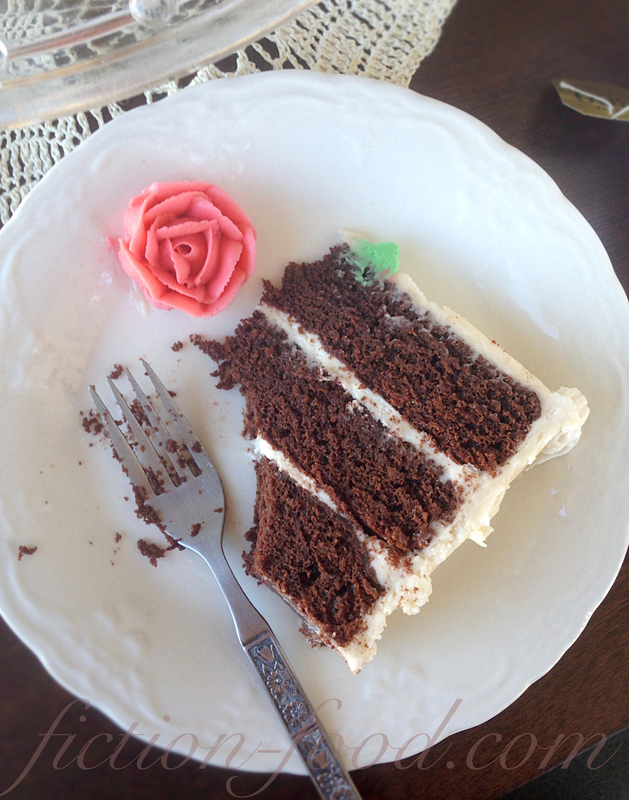 Ms. Bayle said, "It was one of the most delicious cakes I have ever tasted". Also, if you look at one of Marjorie Priceman's illustrations in the beginning of the story, you'll notice a girl that looks like a young Annie Washington (the woman who buys the bake shop after so many years). The film observantly makes this connection and adds to it emotion and depth. "Baking isn't about how it turns out, it's about what you put in." –Cora Lee, "The Bake Shop Ghost"
Me: All of those cakes! Who provided the cakes for the film? I noticed "Vanilla Bake Shop" and "Helena Wirth Cakes" in the end credits. LB: One of the many volunteer's on the project, Ed Turner, made most of the cakes. Some cupcakes came from Vanilla Bake Shop and the cake Annie makes for Cora Lee came from Helena Wirth Cakes. Ed showed the baker at Helena Wirth Cakes the picture in the book and the recipe and he used that to make the cake. JO: ED, a friend of Lorette's, was in charge of getting a cake for the production. She [Lorette] wanted it to be modeled on the cake in the book, so Ed took a copy with him. 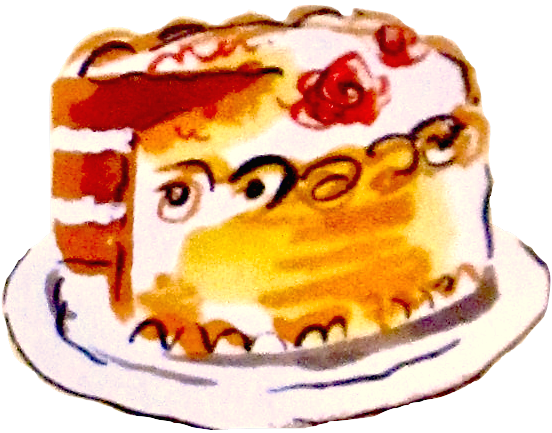 He found a small shop called "Helene's" and the baker agreed to make the cake. The baker had been Helene's assistant for years, and she left him the shop when she died. The baker loved the book, because it was "all about cake." I signed a copy for Ed to give to the baker when he picked up the cake. The baker's wife was there, and said it was a lovely book, and "so true." Ed was confused, but then the wife said, "He still talks to Helene when he works." So the cake in the film was made at a shop where the spirit of the founder is still a presence. Note: The only ingredient change I made to the book's recipe was in the frosting. The original recipe calls for water, and I did make it that way on the first try, but it didn't mix up nicely for me (the texture and consistency wasn't what I wanted) so I made the next batches with heavy cream instead. Also, I'm definitely not a cake decorator and have not had much experience in that department, but I think my little attempt, after a ridiculous amount of trial and error, is a passable homage to Ms. Ogburn's story and Ms. Priceman's illustrations. The cake is truly rich and I'm sure would bring heart-opening tears to a lonely ghost's eyes. *You'll need to make more, up to 3x this amount, but it turns out better if you simply mix up separate batches as you go along. 1. Cake: Preheat your oven to 325ºF. In a large mixing bowl whisk together the 1st 6 ingredients (dry). In a medium pot on medium heat, melt the butter & the chocolate completely, stirring occasionally, being careful that the chocolate doesn't burn on the bottom. Remove from heat. In a small bowl or in a liquid measuring cup, whisk together the water, eggs, & vanilla. Slowly pour the egg/water mixture into the chocolate/butter mixture, whisking constantly until thoroughly combined. Gradually pour the resulting mixture into the dry ingredients while mixing on low speed, just until combined. 2. Grease the 3 round pans & then cut 3 sections of parchment paper to sit in the pans nicely. Rub a little more grease onto the parchment. Pour the cake batter into the 3 pans equally & tap each on the counter to settle the batter. Slide onto the middle oven rack & bake for about 30 mins or until a toothpick inserted into the centers comes out with only a few moist little crumbs. Remove the pans from the oven & then remove the cakes from the pans by carefully lifting them using the parchment paper corners. Transfer the cakes to cooling racks to cool completely. Level the cakes using a large sharp knife & then stack on top of one another with the parchment paper in between & chill in the freezer for a few hours or overnight. 3. Frosting (remember, make a 2nd & 3rd batch as you go, as needed): Sift the powdered sugar into a large mixing bowl & then drop in the softened butter. Mix on low-medium speed until the mixture becomes moist crumbs (butter crumbs). Still mixing, pour in the heavy cream, vanilla, & pinch of salt. Increase the speed to medium-high & mix until you've got a beautiful, fluffy frosting. Cover with a towel when not in use to prevent from crusting. 4. Remove the cakes from the freezer & unstack them. Place 1 round on the plate your will eventually be serving your cake on & evenly spread a dollop of frosting on the top. Stack a 2nd round on top & frost & then stack on the 3rd cake. Spread a thin coating of frosting on top of this one & then continue to frost the sides of all the layers until the cake stack is fully coated in a thin layer of frosting. Place the frosted stack in the fridge to chill for 30 mins or so (crumb coating). Frost the cake about 1/8" - 1/4" thick, all around, smoothing it out as best you can (chilling a little more after frosting can make it easier to smooth out the spread strokes). 5. Decorating: Fix the frosting tips into their respective bags & have them ready to fill (placing the open bag into a tall cup with the bag opening folded down over the cup sides really helps). Rewhip the frosting (or whip up a new batch) & sprinkle in a bit more powdered sugar to make the frosting a little stiffer (like, a tsp. worth). Scoop out about 1/4 cup of frosting into a small bowl & mix in enough green food color gel to get a medium-light green. Spoon this green frosting into the bag with the leaf tip, press out the air & twist to close (or use a little rubber band or hair tie). Next, scoop about 2/3 cup white frosting into another bowl & add enough red to get a light pink. Spoon about half of this into the baggie with the small circle opening & close. Add enough red gel to the remaining pink frosting to get a medium pink. Spoon this into the bag with the flower petal tip (#104) & twist closed. Spoon 1/3 or so white frosting into the bag with the star tip & close. 6. 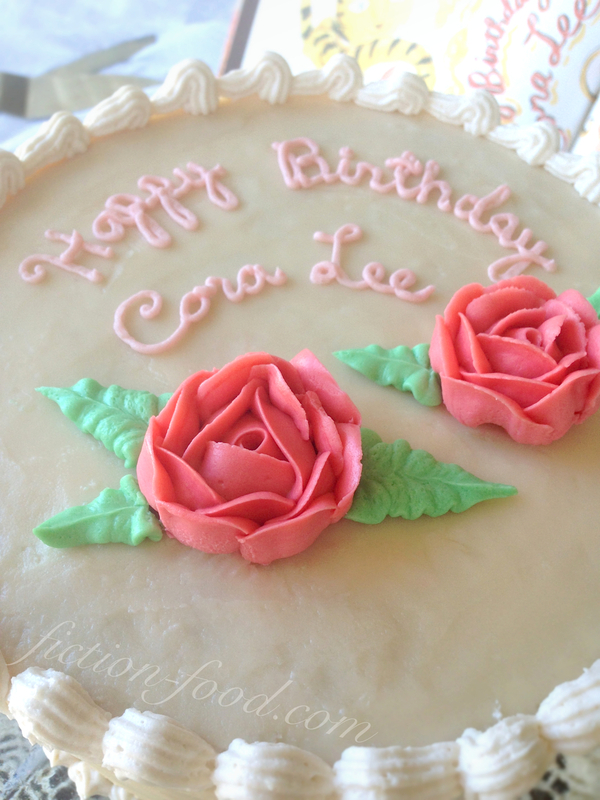 Take the light pink & carefully pipe on the words, in cursive, in a curve, "Happy Birthday". Under that pipe "Cora Lee". If at first you don't succeed, place the cake in the fridge until the letters sturdy up & then carefully remove them with a small knife & re-smooth the white frosting. Then try again. For the flower making step, please watch this how-to video from Global Sugar Art. Make one flower with 7 outer petals & 1 with 5 outer petals. (Letting each flower chill in the fridge for a few minutes–stick them in something that will hold them upright–will make the next step a little easier.) Transfer the flowers onto the cake via small clean scissor (as shown in the video), positioned according to the cake photos in this post. Pipe green leaves at the base of the flowers in the positions shown, making sure the leaf frosting tip is pointing vertically (points up & down, not side to side). The more pressure with which you squeeze & the slower you move the bag, the larger/wider your leaves will be. Grab the bag of white frosting with the star tip & pipe little blips around the very bottom of the cake. Watch this quick tutorial video from LeCordon Blue for how to do the top border on the cake (I used the 1st technique, the shell). Serve a slice of this lovely, rich cake to your crotchety ghost & watch as her expression changes from sour to sweet in a matter of seconds. 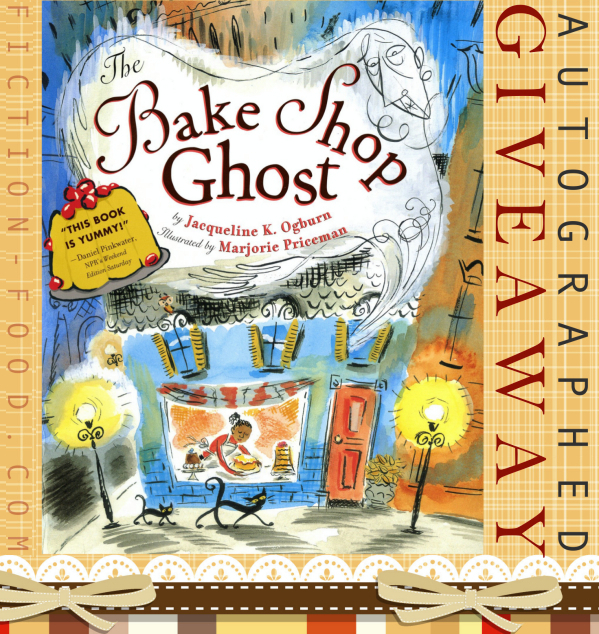 Win a paperback copy of The Bake Shop Ghost signed by author Jacqueline Ogburn! Simply fill in the Rafflecopter form below. This giveaway is open to US residents only and will end on Oct. 13th at 11:59 PM PST. Good luck! Awesome! I was trying to find this short movie so hard last year. I am glad I will be able to see it soon :). Yes! It's really lovely. I'll be sure to let you know once Ms. Bayle contacts me about it. My oldest son will love to try the pleasing chocolate cake. I will hunt for Tiramisu cake. This cake. The Pleasing Chocolate Cake. Looks so good. i was writing about this cake in my blog when i found your very captivating blurg on the book and the recipe. i love your blog and cited in my post on this cake prepared by an officemate for a baby shower party this past february. here is the link on how ellen my friend adapted the recipe. Thanks for sharing your link with me and for sharing this blog post! It's such a yummy and rich cake, isn't it? If I wanted to make this into cupcakes, how would I do that?